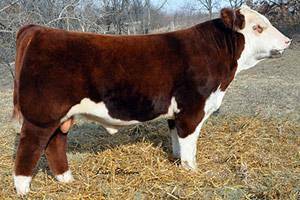 This sound moving, soft haired purebred polled Hereford bull offers more true thickness, bone and mass in a flexible package than any other straight bred bull on the market. His sound-uddered dam, tracing to maternal legends such as 29F, works well with the Online on his sire’s side to offer a strong maternal package. 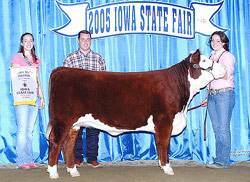 The Umpire is a stout purebred Hereford option that is the right size to produce winning purebred heifers or thick, big boned baldy steers out of any breed of cow. Champion Spring Bull Calf at the 2008 Iowa State Fair, and reserve Spring Bull Calf Champion at the 2008 American Royal and 2008 NAILE.